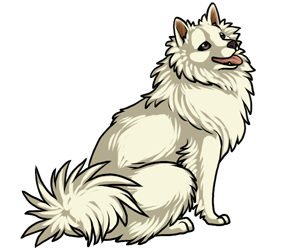 Despite the name, the American Eskimo Dog had nothing to do with the eskimos or eskimo culture. The American Eskimo originated in Germany and was originally called the "German Spitz". Recently they have been used as watchdogs, guard dogs, agility dogs, and other competitive performance dogs. The American Eskimo is related to the Keeshond, Samoyed, and pomeranian. American Eskimos often rank among the top scorers in obedience trials. As an act of patriotism in WWI, many American Eskimo owners began calling their German Spitz "American Spitz".